The proposed Marshall wind project site is located approximately one kilometer east of the village, just north of the airport access road and west of the spur road to Pilcher Mountain. The site was identified during a reconnaissance visit in 2007 as particularly suitable for wind power development. 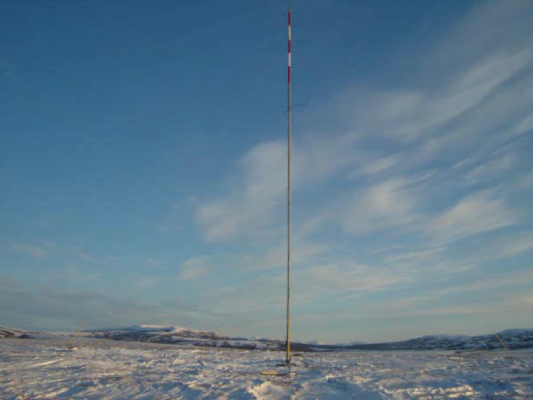 A met tower was installed at the project site in December 2008. Unfortunately it collapsed in an ice storm in October 2009, was replaced in September 2012, and was operational until March 2014. The wind site measured as wind power class 4 (on a scale of 1 to 7), which is quite good for a non-coastal location. V3 Energy, LLC has written several reports and system analyses of wind-diesel power options and potential for Marshall, which are available below. In general, approximately 300 kW of wind power capacity is a desirable initial project configuration for Marshall.